Team XYZ is back home after very successful trips to Arizona and Iowa for the 2017 GoDaddy Road Show! 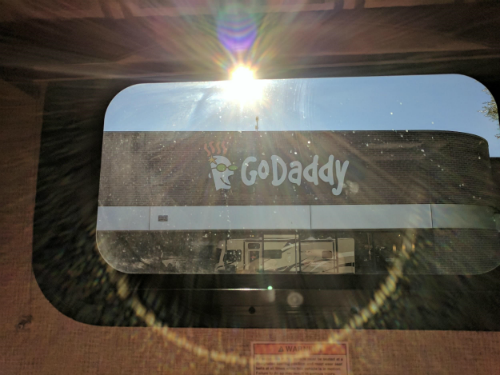 Our first RV adventure out to GoDaddy’s offices was back in 2014, just one week after .xyz entered general availability. Last week, we rode again into the desert, but this time with a bigger RV (coined the XYZmobile) packed with over 5,000 GoDaddy.xyz tshirts and millions of .xyz use cases to share. After the 10 hour drive in heavy LA traffic, our first stop was Scottsdale, Arizona. 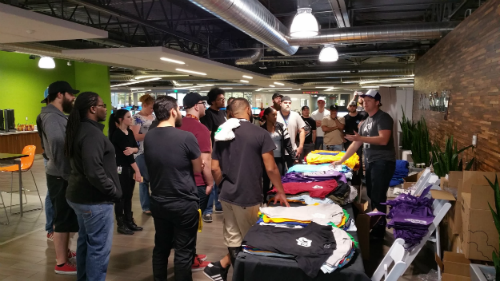 We got right to work unpacking shirts for every GoDaddy employee in the building. We had the pleasure of sharing the stories of notable GoDaddy customers like MIT’s startup accelerator, Engine.xyz, Deloitte’s leadership communities, like GoInnovate.xyz and Exponentials.xyz, and the cofounders of Skype’s new venture, Starship.xyz, among many others (fun fact: they’re all GoDaddy customers too!). After Scottsdale, it was on to our next stop: Tempe. 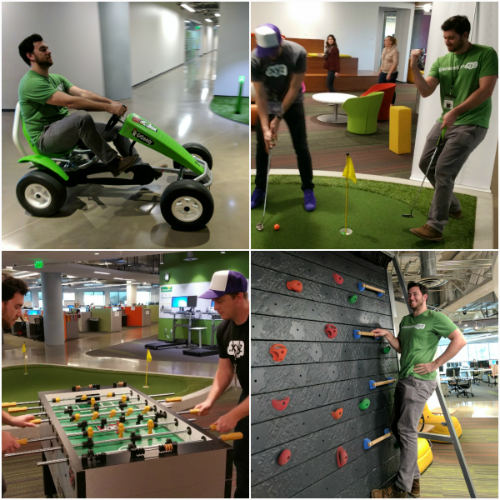 We had heard that GoDaddy’s newest office would be filled with fun activities, and we weren’t disappointed. We even got to take the slide down to lunch! But this trip wasn’t all just fun and games – we met with over 1,000 employees that day to talk about why .xyz is the new go-to domain ending and how their customers could take advantage of GoDaddy’s $0.99 .xyz sale. And as the home of Premier Services, we also had a chance to meet with the team about our trio of automotive domains, .Cars/.Car/.Auto. Our last stop in the XYZmobile was Gilbert. By now, word had spread across Phoenix that the XYZ Team was in town. And with 2 long days of experience now under our belts, we were able to incorporate some of the success stories from the other offices into our training. 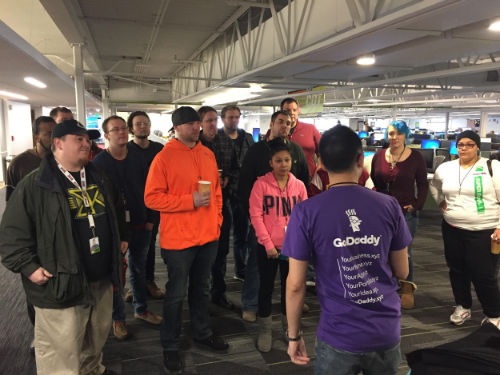 We were even lucky enough to meet many of C3’s newest faces and welcomed them with their very own GoDaddy.xyz tshirts and other XYZ swag. For some of the XYZ Team, Gilbert was a great end to our time in Arizona and a trip we won’t soon forget. But for a few others, there was still one last day at the office where it all began: Hiawatha, Iowa. This was originally the office of Parsons Technology, which was acquired by Intuit in 1994. Years later, as we were told by someone in the know, GoDaddy moved back into this office when they first began selling domain names. The rest was history. After seeing 4 cities and speaking to thousands of GoDaddy employees about the innovators in the #GenXYZ community, we settled back into our Santa Monica home and closed out the 2017 GoDaddy Road Show. In the 2.5 years since the last Road Show, .xyz has been adopted in over 230 countries to become the most popular new domain in the world. And thanks to our valued partners like GoDaddy, XYZ has leveraged its success to welcome nine more domain extensions to the family to create innovation and choice on the internet. View the full Road Show album! Do you work at GoDaddy? Be sure to check out our useful tools below or contact us with your questions! If you haven’t yet registered your .xyz domains, head to GoDaddy.xyz or ask them about their 99¢ .xyz domain sale! Get your .xyz domain for 99¢!